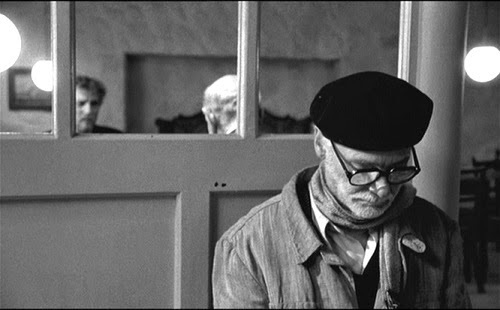 With The Man From London (2007), Béla Tarr creates what David Bordwell might characterize as a "grave and majestic" portrait of a conflicted man gripped by a state of scepsis. 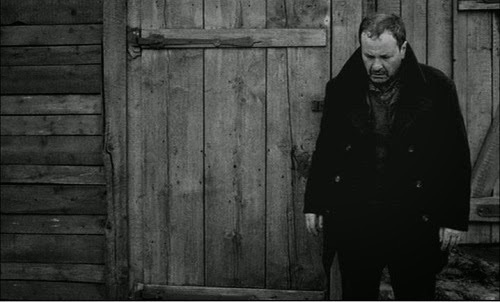 Tethered to the mundane, Maloin (Miroslav Krobot)—as Tarr describes him—"lives simply, without prospects, beside the infinite sea, takes little notice of the world around him, accepts his slow and inevitable deterioration of life and almost complete isolation. Gradually his contacts shrink and become mechanical." And then something remarkable happens. Maloin witnesses a murder and retrieves a valise of stolen money. "The temptation of a new life of a different quality takes hold over him." But it is exactly a new life configured as "temptation" that thrusts Maloin into moral rupture, a questioning of all with which he has held faith. As Darren Hughes has suggested to me in conversation, the suspense inherent in The Man From London is precisely a question of faith. 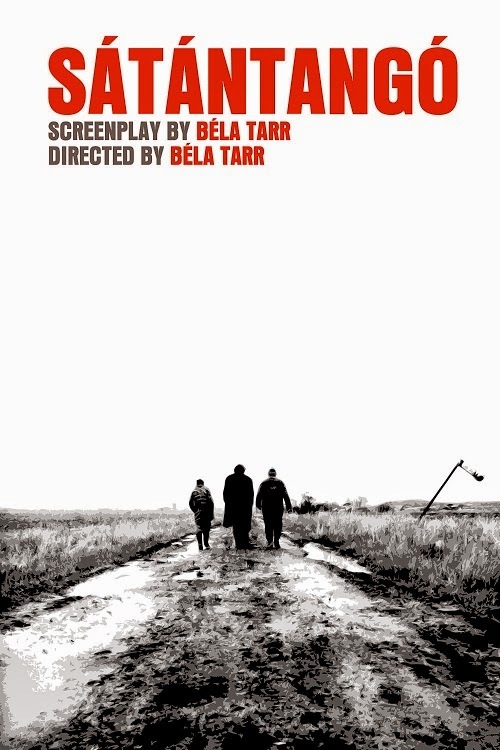 Premiering at the 2007 Cannes Film Festival, The Man From London then docked on North American shores at the 2007 Toronto International Film Festival where I was offered the chance to speak with Béla Tarr. A reputed contrarian, I found myself uncharacteristically nervous on my way to meet him. I didn't know what else to do but to be upfront about it. I admitted to him that I was terrified of him; that I had heard he chewed up journalists like me for lunch and spit them out. His piercing blue eyes twinkled, and he laughed, put his hand on my shoulder and, in a warm, honey-thick accented voice, assured me, "Don't worry." Michael Guillén: Béla, when I was a young kid, I was taught that it is in the performance of your everyday tasks that your radiance shines through. Your films demonstrate this repeatedly, specifically The Man From London. Can you talk about why revealing the eternal through the everyday is such an important theme for you? 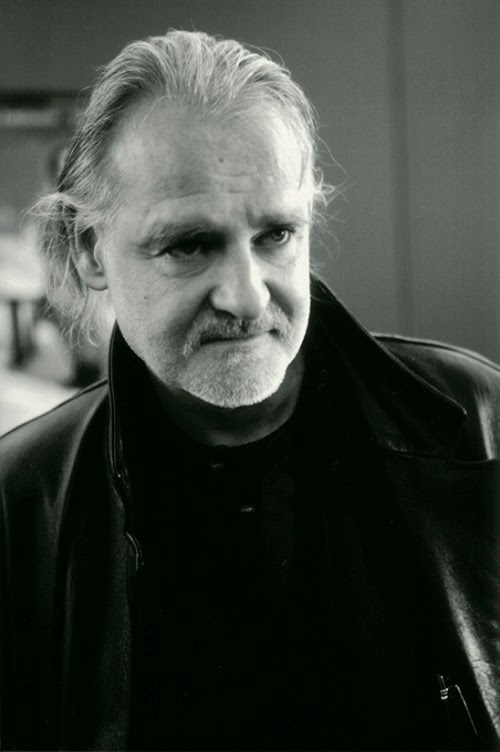 Béla Tarr: I have to go back to the time when I did my first movie, which was about a social problem. In this re-creation, which was terribly concrete, I could find something that was a little bit more than the daily life. Since that moment 30 years ago, I have always been interested in the concrete situation; but, if it's too concrete, I'm really not interested. I've just always tried to find some cosmological significance in this micro situation. It's a kind of microcosmos. I like very much Bartók's "Mikrokosmos"; do you know this piece? Tarr: That's all. For me it's always important to tell you something and show something which is really eternal; but it's always happening. It's happening with us now. Guillén: It's intriguing to me that you would use that term "microcosmos" because the same person who taught me about radiance coming through the performance of everyday tasks likewise used the term "microcosmic-macrocosmic correspondence"—or as the Taoists would say, "As above; so below"—to describe the human relationship to the eternal. Guillén: I've seen three of your films—Sátántangó (1994), Werckmeister Harmonies (2000), and now The Man From London, which I've found to be the most accessible of the three. In all three, I'm struck not only by the movement of your camera but the movement of your actors and how your camera tracks their ambulations. There are long tracking shots where the actors walk some distance—distances they're familiar with—and with which the audience becomes familiar, as if becoming accustomed to the everyday routes and routines of your characters. Route equals routine, in other words, and how the route varies signifies a change in routine. Further, this abstraction is compounded by the fact that the faces of your characters are nearly void of affect. They reveal little. Which serves to emphasize that underneath there is a lot of thought and emotion going on, a lot of internalization. It seems you try to remedy this through close-ups on the face whereby glimpses are shown of the internal activity, invariably through the eyes. You do this rather than having them act out anything that reveals what's within. Why do you take that taciturn approach? Tarr: That's really a part of the practical work. I know two kinds of directors. One who reads the script and is concentrating on the story line. That is something I never do. I'm always listening for the characters and the personalities of the actors. For me, the most important thing is to show you how they are living, how it goes for them in their real life, and how they communicate. Normally, it's mostly eye contact. If you watch someone's eyes for a long time, it's not necessary to use any words because you will begin to understand and will see what is happening. You can see what is happening inside because his or her eyes will tell you and show you. That's why I trust my actors and trust, of course, the situation because the situation has to be perfect physically, psychologically. At every point the situation has to be perfect and comfortable because, in this case, the actors are not acting anymore; they are just being. You can see the real life and you can see the real personality of this actor or the character. You can go with them. It's not necessary to tell and tell and tell. I'm fed up with this whole narrative thing because the movie—you know what?—without the narrative, the movie has a chance; you can show something. It's not necessary to tell. Do you remember the end take of the Werckmeister Harmonies? When the old man goes to the eye of the whale? 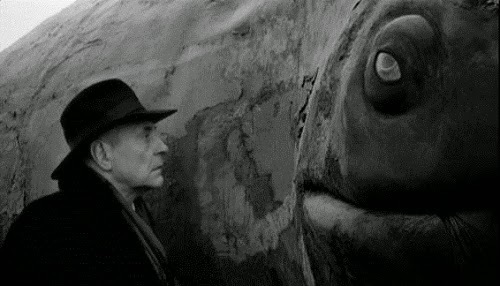 Tarr: Nobody can ever tell you by words what is happening in this old man and in this sad eye of the whale. But I can show you and that's enough. I trust your eyes and I trust your heart and I trust your emotions. I really trust the audience. Guillén: Speaking of what's said with the eyes, in The Man From London there were two scenes that brought my heart to my throat. The first was when Maloin comes to take his daughter Henriette (Erika Bók) away from her abusive employer, the butcher's wife. Her anger, registered through her eyes, could have stopped a clock! Who is that actress and how did you come to cast her? Tarr: She's Kati Lázár. I've worked with her before in Werckmeister Harmonies. She was in the newspaper office and the post office. She played the woman who selected the newspapers. She's an actress in Hungary working mostly in the theater; but, I like her very much. 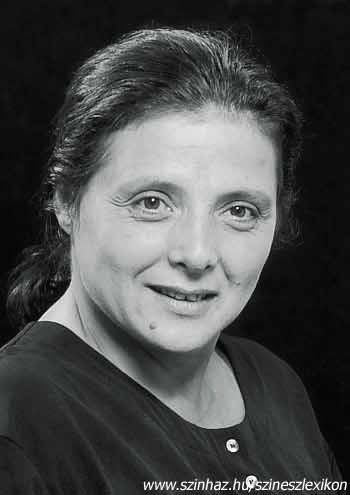 Guillén: The other scene I loved was when Mrs. Brown (Ági Szirtes) realizes that her husband—"The Man From London"—has been caught up in something more than she can cope with. I don't know how you did it, maybe it's the sheer magic of the camera, but her tear as it wells in the corner of her eye glitters and sparkles. It is so beautiful and moving. Tarr: I told her, "You have to do this process." From when she gets the news to when she understands how she's been blackmailed. How they are pushing her. That was also important. One thing is sure, we are really doing movies about human dignity, which is always being destroyed throughout the day. The challenge becomes finding actors who can show you the dignity of the character. In such a situation, you can get real human reactions. That's terribly important for me; that my actors have a strong dignity. Guillén: There's a genuine momentum to your actors. Their actions don't appear staged. They seem to come right out of the situations they're in, from the storyline. Tarr: From the situation, not the storyline. We never talk about the story because it's not important. We just talk about the real situation, the physical situation. Guillén: In this situation then, where you're adapting a novel, which has its own narrative integrity, how do you work with your actors? Do you single out specific scenes or situations that have a psychological validity for their characters? Tarr: No, no. The script is written. László Krasznahorkai and I decide together how we want the script. I've worked with him for 25 years. Before filming, we decide what kind of situations are going to be in the movie and we write that down. On the other hand, we change things during the shooting. Several times we reduce the text, allowing more chance for the meta-communications than the verbal communication. It's absolutely necessary because several times the actors speak different languages. For example, Maloin was Czech, Tilda Swinton was Scottish, the daughter in the movie, she's Hungarian. You know, she was the small girl from Sátántangó? Now she's 22. I'm very faithful. I like to work with the same people. Guillén: I imagine they understand what you're going for better? Tarr: Yes, it's much easier. I don't talk too much during shooting. Maybe just something like, "Louder. Lower. Faster. Slower." That's enough. Because if you have the right cast, if you have the right situation physically and psychologically, and if they are able to be, it is not necessary to direct. I'm not directing. It just looks like a conductor. If you have good musicians and a good musical piece, if you trust the whole staff, then in this case you just say, "Okay, now." That's enough. Guillén: Part of the artistry of your work, however, is that you have fully thought things out way ahead of shooting. You arrive to the set prepared. The sinuosity of your camera, your track shots, are amazing and require prolonged choreography. How do you set up that choreography? What's your relationship with your camera man? Do you try different things out? Tarr: No, no. First of all, you have to know I'm terribly autocratic. I have a very strong imagination about the picture and I know very well the whole movie before we start to build the set. They build the set for what I have imagined. When I hunted for the location, it was very important for me to find the geographical conditions for what I imagined. When I found the place, then we could start to build the signal cage and put in the train tracks and the train and the boat. We put everything together and then afterwards it was very easy to build the track for the camera and it was ready. Guillén: What is it about the long take that you love so much? You're famous for this and your long takes are sinuously eloquent. Why do long takes serve your vision? Tarr: There are several reasons. First of all, the long take has a different tension. If you are shooting short takes your actors have a chance to escape. Short takes are terribly boring for me. Guillén: It becomes more editing than filming? Tarr: No, no, it's just boring. I don't feel I'm creating something. With long takes, you build together the actors and the situation and the camera movement. Building step by step is what I enjoy very much. Here is the first thing, and then you move from here, and this is the turning point, and then here comes a close-up, and then in the next moment we open the picture wide to the landscape, and then another close-up cutting this wide picture, then we move further, and finally, we will arrive to the entry. It has to be very well-composed. The technicians have to be very well-trained. Everything has to work together in a long shot. This is a special tension for the technicians, the camera crew, the actors. The actors have no chance to leave because we are watching their eyes. We are watching longer and longer and longer. That's why everybody is really under pressure. That's why you can watch something finally; what you cannot see if we do the movie in a different way, or the traditional way. 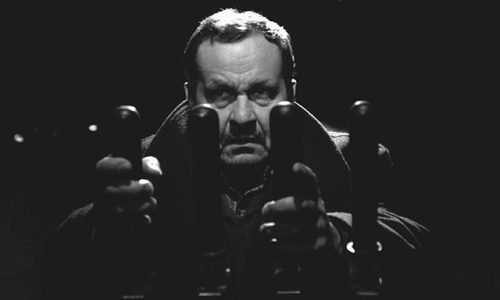 Guillén: I found it incredibly suspenseful when Inspector Morrison (István Lénárt) is deducing what's happened, replicating the actions of the opening murder sequence, which is being filmed with the same camera movements as the opening sequence. However, there's this added layer of the audience (as Maloin) watching Morrison figure it all out. When Morrison goes down to the dock, looks in the water, and then looks back up at Maloin's signal cage, you know he's got it and that Maloin (and you as the audience) have become incriminated. Tarr: It's a similar shot but it's not the same shot. Guillén: Can we talk about your score? The music for your movie? You have a hypnotic accordion that keeps playing the same melody throughout the film. It's as if you're purposely mesmerizing your audience through a prolonged contemplation. Would you consider your films to be contemplative cinema? In the press notes you use the term "pure cinema." Guillén: Can you explain what you mean by "pure cinema"? And would pure cinema be comparable to contemplative cinema? Tarr: [A deep, patient breath.] I'm able to tell you only one thing. What we are trying to do is more and more and more pure cinema, which is maybe less and less and less story, less and less details, and of course, I really would like to go deeper and deeper and deeper in the human soul. I want to understand something because I'm always just discovering, discovering, discovering something, some new thing, some new possibilities in the film language. Of course, I keep some things but I'm always finding new things I can use. I really like to listen to people. I don't like the artificial anymore. I want to go in like a miner, deeper and deeper. That's what I think. That's why I think I can do it always in one way if I'm more and more simple. What we are doing, it's really on the edge. It's a risk. Guillén: Returning to your music if we may. Most scores in films are manipulative. They signal what the audience is supposed to feel. Your music, however, is not manipulative. Tarr: It's a part of the movie. Guillén: It sets a tone of attention. It says, "This is where you mind has to come to in order to absorb the images that are on their way." How did you decide on the music? Tarr: It's a very simple step. I've been working with the composer Mihály Vig since 1983, about 24 years. He's a poet and a rock musician. He's also writing something. He's a very energetic man. He's a part of my family. We are always together when we are working. Before the shooting, I tell him what we think about the movie, how we believe, and I ask him to do some music. He goes to his studio, he records something, and then he comes back to me with his disk. We listen, we choose, we discuss. Maybe he goes back, maybe several times he goes back to the studio to change something. Maybe he just changes an instrument and then he comes back. Afterwards, the music is ready and we use the music during the shooting. Guillén: So the actors are actually listening to the music while you're shooting? Tarr: Yes. The actors are listening, the camera crew is listening. When we watch this stupid, small monitor, we see immediately the movie. We know how it will be. There will be differences of course, because some of the actors will have to be dubbed in; but mostly, the whole staff is ready during the shooting. The post-production is a short period of time. When we finish the movie, it's ready. We cannot change anything on the editing table. We use the editing table only for a few days. Guillén: I don't know how you'd be able to edit some of your long shots. Tarr: No, no. We just put it together. That's why I have to know, and everybody has to know, how is the whole movie going to be? We have to know, okay, this take is going to finish in a white out and how will the next one connect and how will we do the lighting? 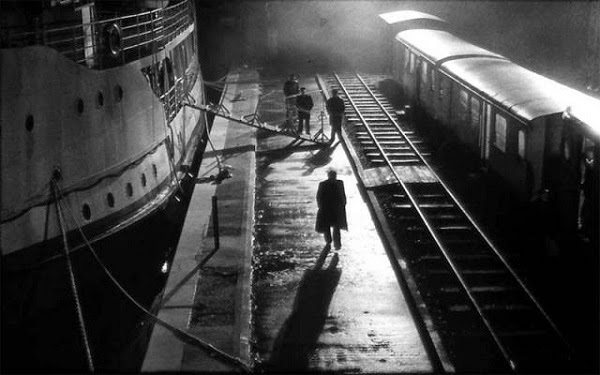 Guillén: The lighting in The Man From London is phenomenal; the term being commonly used is "noirish." I especially liked how you lit the night scenes with the buildings in the background illuminated from ground level. Is your lighting designer, Fred Kelemen, another individual in your production ensemble with whom you've been working with for years? Tarr: The director of photography, the gaffer and me, this is our job. I have a strong imagination and we are always discussing the lighting. It has to be perfect. Guillén: It's lustrous! You've perfectly captured night's luster. Throughout the film you fade to black-outs and yet you make the choice in the ending close-up shot of Mrs. Brown's face to fade to white. Why that choice to fade to white? Tarr: Because while I was shooting her face, I noticed her face was getting whiter and whiter. So we put the lamps a little bit closer to her face and a little brighter and then finally we did it in total white. Guillén: Not having read Georges Simenon's novel upon which The Man From London is based, I don't know whether the scene where Maloin takes the food to Mr. Brown is as it was written. Was it your choice not to show us what happens? Tarr: Something has to happen but you don't know what, yes. Guillén: Why that exclusion? Why not show us? Tarr: Because I think it's much more powerful if you don't see. I'm really not an action director. I really don't know. If I tried to direct action, I would become ridiculous. What we wanted to show you was how he went into the shed and then how he comes out. The difference is what is totally important. Afterwards you can understand why he confesses. Guillén: What I was trying to say earlier about how your characters move in your films—they carry the burden of their own truths. The gravitas is embodied. They don't have to show it all in their faces. Their bodies express the weight of who they are. This is particularly evident in Maloin's body language when he emerges from the shed. He's a different person for what has happened in there. You don't necessarily have to see what happened to know its effect. 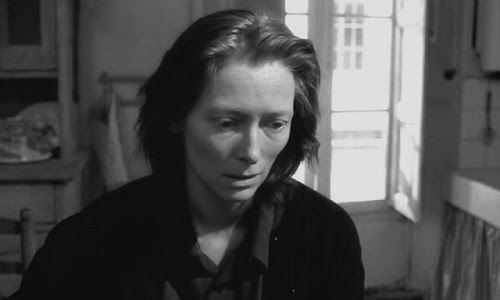 My final question: Your casting of Tilda Swinton as Maloin's wife. How did that come about? Tarr: She immediately said yes when I called her. Guillén: Was it her face you wanted? Tarr: Yes, her eyes. Her personality. I must say that, for me, she's not a Hollywood actress. You know she was working with Derek Jarman, she played Orlando, she did some serious acting in Europe, and for Europeans, she's not just somebody from Hollywood. She's really a European intellectual. She's a very clever, well-educated, intelligent woman who is full of sensibility and that's why it was totally natural to work with her. There was no question. It was really nice to work with her and we still love each other. This work couldn't destroy our relationship. Guillén: You really helped me focus on just how beautiful and unique her face is through this movie. Well, Béla, they're signaling me to stop. This has been one of the highlights of my filmwriting career. Thank you so much for your time, your kindness, and your beautiful film. I hope it's received with an open heart and an open mind. Tarr: I hope so too. That's important. Thanks a lot. 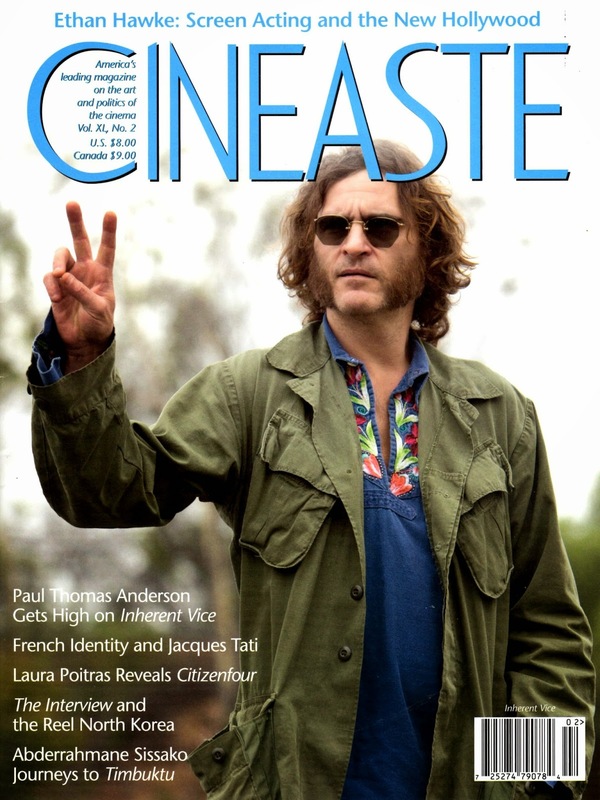 I'm proud to announce the publication of the Spring 2015 issue of Cineaste (40:2) magazine, in which two of my interviews have been published. The print issue includes my conversation with Abderrahmane Sissako ("Hidden Certainties and Active Doubts") regarding his Oscar®-nominated film Timbuktu, and—as a web exclusive—"Cinema as Spiritual Literature: Andrey Zvyagintsev Discusses Leviathan", which won this year's Golden Globe® for Best Foreign Language film, and was Oscar®-nominated as well. It's a strong issue that includes Brian Neve's feature article "Working-Class Noir in the Blacklist Era: The Making of Cy Endfield's The Sound of Fury", which should be of special interest to Noir City aficionados who were on hand for the premiere of the film's restoration print by the Film Noir Foundation two years back. 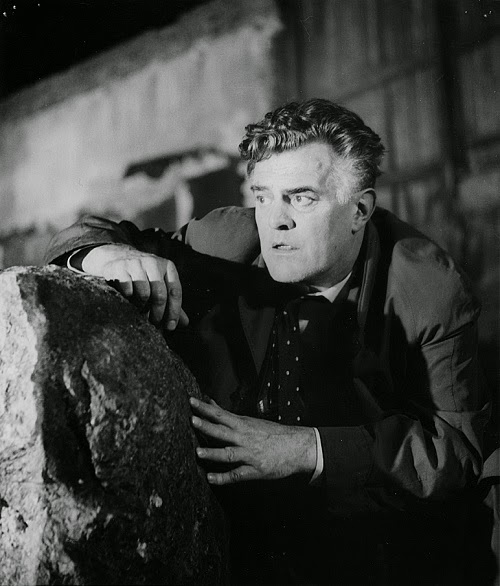 Neve's article is an excerpt from his forthcoming biography, The Many Lives of Cy Endfield: Film Noir, the Blacklist, and Zulu, to be published this summer by the University of Wisconsin Press. Steve Erickson's feature article "Voyeurs in the Hermit Kingdom: The Interview and Other Films on North Korea" enables a discussion "on the art and politics of cinema" per Cineaste's stated focus, and is contextualized in the magazine's editorial for the issue, which asserts that The Interview "doesn't earn the headlines it sowed." A preview of Darragh O'Donoghue's feature article "Monsieur Hulot's History: Jacques Tati Pictures Modern France" will whet your appetite to read the full piece to better appreciate the Criterion Collection's recently-released box set "The Complete Jacques Tati" which includes six feature films and seven feature shorts, accompanied by a 62-page booklet. A preview of Adam Nayman's review of Paul Thomas Anderson's Inherent Vice is available, to be paired with Pierre Sauvage's "Beware the Golden Fang! : An Interview with Paul Thomas Anderson." There's also a preview of Gary Bettinson's interview with Ethan Hawke on "Screen Acting and the New Hollywood." Further interviews in this issue include Richard Porton's "Birth of a Whistle-Blower: An Interview with Laura Poitras"—whose Citizenfour just won the Academy Award® for Best Documentary Feature—and Declan McGrath's "Moments of Transcendence: An Interview with John Boorman." As a fellow web exclusive, Cineaste offers Aaron Cutler's "Two Shots Fired: An Interview with Martín Rejtman." Accompanying my interview with Sissako is Maria Garcia's review of Timbuktu. Further reviews include Rosewater (Karen Blackstein), Human Capital (Darragh O'Donoghue), Life of Riley (Jordan Cronk), and Clouds of Sils Maria (Graham Fuller). DVD reviews include the 1988 and 1993 versions of The Vanishing (Robert Cashill), The Conformist (Deborah Young), Man of the West (Christopher Sharrett), Level Five (David Sterritt), Tootsie (Matthew Hays), Diary of a Lost Girl, Massillon, The Promised Land, The Shooting, Ride in the Whirlwind, and Verdun: Looking at History (recommended by Cineaste Editors), and—as web exclusives—Whiplash (Travis Maiuro and Cynthia Lucia), Che! (Robert Cashill), Bloody Mama (Christopher Sharrett) and The Lusty Men (Leonard Quart). Book reviews include Tom Cruise: Anatomy of an Actor and Robert De Niro: Anatomy of an Actor (Adam Nayman), The Cinema of Clint Eastwood: Chronicles of America and Clint Eastwood's America (Michal Oleszczyk), German Cinema—Terror and Trauma: Cultural Memory Since 1945 (Stuart Liebman), Terence Davies (Jamie Dunn), Approaching the End: Imagining Apocalypse in American Film (Joseph Yanick), and Sound, Speech, Music in Soviet and Post-Soviet Cinema (Michael Joshua Rowin). Finally, available as a web exclusive, Jared Rapfogel reports from The 2014 Thessaloniki International Film Festival. All available on newstands now! 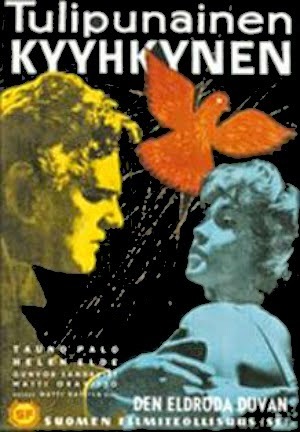 Now here's a very odd double-bill pairing Finnish director Matti Kassila's Tulipunainen kyyhkynen (The Scarlet Dove, 1961) with Hong Kong's Tian-lin Wang's Ye Mei Gui Zhi Lian (The Wild, Wild Rose, 1960), "where"—as Donald Malcolm writes in his program notes—" 'bad marriages' take on both operatic and oneiric dimensions." The second evening of Donald Malcolm and Elliot Lavine's international noir series "A Rare Noir Is Good to Find" (running Thursday-Monday, March 19-23, 2015, at the Roxie Theater) is encaptioned "Perilous Love" and—though one of the most redeeming qualities of the series is exposure to rare films and the talent behind them (The Scarlet Dove features Tauno Palo in his final feature film performance directed by Matti Kassila, who Malcolm identifies as "one of the giants in post-WWII Finnish cinema")—I have to be honest and say that I had a difficult time appreciating The Scarlet Dove because of Osmo Lindeman's jarring and obnoxious avant-garde "score" that sounds like a feral cat on LSD let loose on piano wires. If you don't mind your nerves being needlessly jangled for 86 minutes, then perhaps you won't be as distracted as I was from this nightmarish tale of a doctor on the run suspected of killing his wife. In Kassila's nocturnal scenario, middle-aged Dr. Olavi Aitamaa (Palo) suspects his younger wife of infidelity and stealthily follows her into the city where she does, indeed, meet up with her handsome young lover. Cuckolded, and constantly reminded of the fact by a cackling old man who keeps showing up wherever he goes, the devastated doctor licks his wounds like an old dog underneath the piers where he is unexpectedly approached and seduced by a "scarlet dove" (Helen Elde) who invites him to her ramshackle apartment, only to have her abruptly change face. As if he wasn't emasculated enough, he returns to the rendezvous point for his wife and lover only to discover she has been murdered. A story in the grip of an overused contrivance, The Scarlet Dove begs its audience at the end of the film not to reveal its conceit. I won't, but I found it far from satisfying. The build-up has its surreal moments, with impressive cinematography by Kalle Peronkoski and solid performances from its ensemble—especially Helen Elde as the sweet-and-sour "scarlet dove" (i.e., prostitute) that reminds Dr. Aitamaa of his first love—but the pay-off falters. Maybe it won't for you? Grace Chang's sensual embodiment of Georges Bizet's most famous opera Carmen is given a postmodern treatment in Tian-lin Wang's The Wild, Wild Rose. Wang transposes the opera's Seville locations to the noirish ambiance of Hong Kong's Wanchai district. This one-off screening at the Roxie Theatre is a not-to-be-missed experience in their international noir series. Back in 2006, anticipating the local premiere of Tsai Ming-Liang's The Wayward Cloud (2005) at the San Francisco International Film Festival, Roger Garcia recommended I watch the films of Grace Chang to better appreciate Tsai Ming-Liang's latest effort, so—following his cue—I secured copies of Mambo Girl and The Wild, Wild Rose. What follows are my notes from 2006, revisited with follow-up research. At Wonders in the Dark, Allan Fish does a good job of enumerating the many filmic adaptations of Bizet's Carmen, from Cecil B. DeMille's 1915 silent version with opera star Geraldine Farrar, to Rita Hayworth in "the bizarre mess" The Loves of Carmen (1948), through Otto Preminger's Carmen Jones (1954), and beyond. Rich with an insider's perspective that deflates Western reductions of The Wild, Wild Rose to mere kitsch—although it can be enjoyed on that level, it is considerably more—Doundou Tchil (Classical Iconoclast) provides the historical and socio-economic context to better situate and appreciate the film's achievement. He writes that the film's importance lies in its "extremely pointed commentary on Chinese values at a time of great upheaval in Chinese society. It's set in Hong Kong, a city where everyone was a refugee, even the local born. Millions of people had been dislocated in China after decades of war and chaos. Like many films at that time, The Wild, Wild Rose begins with shots of neon lights and glittering nightlife, symbolizing prosperity. But this hedonism unfolds against a background of extreme suffering and deprivation." In his Slant essay on the film, Kevin B. Lee concurs: "Ensconced in cosmopolitan culture, from airliners to mambo clubs, Cathay's urbane entertainments envisioned a Hong Kong jet set that presaged the city's eventual ascendance as an economic powerhouse." I'm going to ask my readers to keep these comments in mind when we later approach Salón Mexico (1949), the Mexican noir in the series, to understand how socio-economic conditions and class conflict energize noir's narrative impulses. Further contextualizing the film's class critique, Tchil reiterates that The Wild, Wild Rose is the "product of an exile community, made in a city where everyone had been a refugee, as Hong Kong itself had been depopulated under Japanese occupation. Everyone involved in this film, at every level, including [Grace Chang] herself, was a refugee who knew about trauma first hand. There are no gypsies in this version of Carmen, and Deng Sijia is an insider, but the whole film is a paradigm of dislocation and social chaos. So this film is, in a way, the voice of a minority that speaks for us all." As the fiery nightclub singer Deng Sijia, Chang's temptress is an amalgram of Bizet's Carmen and Josef von Sternberg's The Blue Angel. It's not her fault that men are drawn to her like moths to the flame. When the naïve new pianist Liang Hanhua (Yang Chang) arrives to work at the club where she performs, Sijia takes a bet that she can seduce him and steal him away from his fiancé within 10 days. It's hardly a challenge, and just as readily leads to ruinous tragedy, not only for him, but for her. Despite herself, she becomes emotionally entangled with this train wreck of a man and the two spiral downwards towards mutually-insured destruction. Though I can't quite say Sajia possesses duende, The Wild, Wild Rose is rich with flamencano flourishes and transnational guises. Not only does Chang impersonate a Latin femme fatale, but she poses as a contrite geisha as well (but, only to land a nightclub audition). 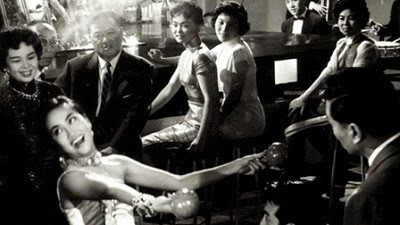 The film's stylized production design, memorable songs by Japanese composer Ryôichi Hattori, and Ming Huang's cinematography set a high standard among Hong Kong films of this kind from the '50s and '60s. 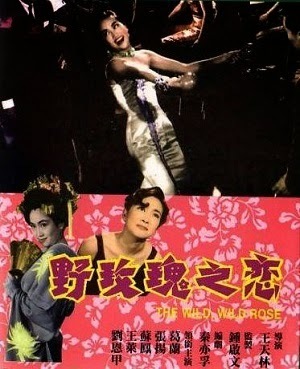 Time Out Hong Kong includes The Wild, Wild Rose in its list of the 100 greatest Hong Kong films and—in an Asia Weekly poll of the greatest Chinese films of the 20th century—The Wild, Wild Rose, likewise made the list. 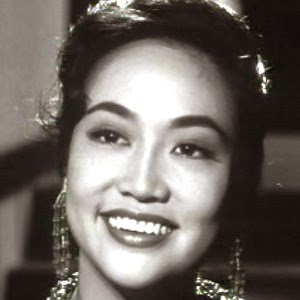 At Senses of Cinema, Frank Bren observed in his 2001 Top Ten list (no longer available on the site) that Hong Kong films of the '50s and '60s "concerned frustrated love" and were made "moving" thanks to great female stars of the era like Grace Chang. 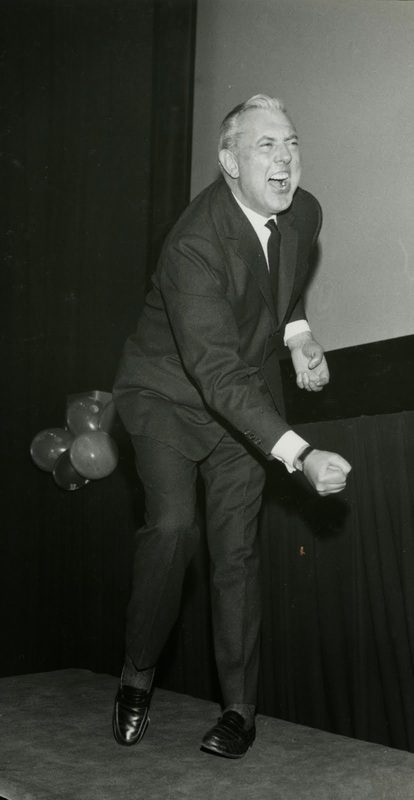 Concomitantly, in his Senses of Cinema report from the 40th Golden Horse Awards, Charles Leary noted that one of the familiar traits of the Cathay melodrama of the 1960s is the characterization of its male leads as victimized and pitiful. Further: "As in many Cathay films, the women are the real attraction, particularly the great singer and dancer, Mambo Girl Grace Chang." 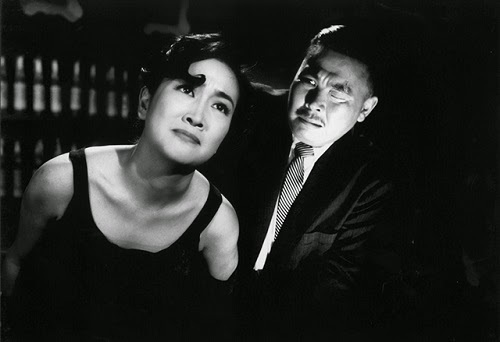 Lisa Roosen-Runge's Senses of Cinema report from the 26th Hong Kong International Film Festival (March–April 2002)—again, unfortunately, off the site—included a profile of the Hong Kong Film Archive series of classic Mandarin films presented during that year's festival. She outlined that the Cathay studio started operating as MP & GI in Hong Kong in 1957, and produced roughly 250 films in the following decade. These films often had similar casts, with character actors from amongst the studio group of actors. She concurs with Leary that The Wild, Wild Rose showcases Grace Chang's dynamism in contrast to the ill-destined male lead who plays out the typical path in these films, generally making wrong decisions and exemplifying what Stephen Teo calls the "weak romantic hero" [Stephen Teo, Hong Kong Cinema: The Extra Dimensions, BFI, 1997, p. 76]. Distinguishing Sijia from her famous Spanish counterpart, Kevin B. Lee details the dynamics of her fatal attraction to her lover: "Sijia tries to make a decent go as a homemaker for Hanhua, but his drunken profligacy forces her to return to the stage, notably as a contrite Madame Butterfly bowing in geisha garb. Recalling Marlene Dietrich's stunning journey of self-discovery in Morocco, Sijia's volatile transformation from a carefree material girl into a bitterly tragic maternal figure for her childish husband (a typical male counterpart to the Cathay heroine) gives layers of drama to the Grace Chang persona. No longer does she simply represent an escapist fantasy for Chinese hipsters, but a fierce assertion of individualist womanhood who insists on her freedom of choice, even in the face of an oppressive reality." Tchil adds overtones to the scene where Sijia, needing to return to work, auditions for a new nightclub. She sings "Un bel di", Tchil explains, "dressed as Madame Butterfly, the nice girl forced into prostitution who sacrifices herself for love. In 1960 the image was still slightly shocking as memories of the Japanese occupation were still fresh. It's a parody of submissiveness." Tchil further distinguishes the gender reversals in The Wild, Wild Rose as focused on politics, not sexual preference. "The nightclub is society in microcosm," he writes, "Nightclub hostesses are bought like commodities." Sijia resists, shakes up assumptions, and subverts the trend. "I sing", she tells her friend who has a sugar daddy, "I don't sleep with customers." Just as she doesn't sell out as an artist, she doesn't sell herself. In one scene she hands Liang the score to "La donna è mobile" ("The Woman Is Fickle") from Giuseppe Verdi's opera Rigoletto. "You can't sing this" he protests, because he knows "La donna è mobile" should be sung by a male character, The Duke in Rigoletto. But Sijia understands its meaning, Tchil explains, and "overturns the Duke's refusal to accept responsibility for his actions. Women are fickle, she implies, because they can't depend on men. She's dressed as Escamillo in cape and toreador hat. Later she appears in a man's flamenco costume, wearing tight pants with buttons up to her waist. Gender stereotypes are shattered." Once again, she resembles Marlene Deitrich's cross-dressing subversions. She challenges class, status and social mores; the thorn of the wild rose. Yet, despite her thorny defiance, Sijia is unable to escape her fate any more than Carmen. Her strength is brought down by a weak male. Her alcoholic lover is so fixated on the old order that—even though unemployed—he won't allow Sijia her creative autonomy. In this tragic consequence, "The Wild Wild Rose could teach western culture a thing or two" Tchil asserts, which appears evident when—55 years after its making—American actress Patricia Arquette feels compelled to make a plea for gender equality during her Oscar® acceptance speech. Grace Chang's specific portrayal of Sijia in The Wild, Wild Rose, and the general popularity of her career, speaks to a modern vision of emancipated female roles in cinema and, by extension, society. 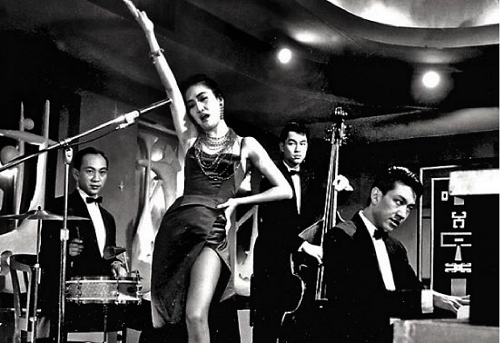 "As a singer and actress," Kevin Lee writes, "Chang exuded a liberated, free-wheeling persona that ushered an era of swinging times among a generation of post-war Chinese. Chang's voice, powered by years of Peking opera training, rings with a bell-like clarity that compensates for its lack of delicacy or restraint. And when hitched to a mean mambo rhythm and lyrics like 'shaking bodies drive everyone wild ... dance as crazy, crazy, crazy as I am! ', her clarion call threatens to topple thousands of years of Chinese repression." She does, indeed, become—as Tchil phrased earlier—"the voice of a minority that speaks for us all." Folded into that, of course—much like the Gay movement took cues from the Women's movement—is queer identification with the larger-than-life cinematic persona of Grace Chang. Lee explains: "The butchiness of her stentorian singing makes her ripe for camp appreciation among contemporary Sino-queers, including Tsai Ming-liang, who offered touchingly makeshift homages to her song-dance numbers in The Hole. But her lasting impact on Chinese cinema is no less important than Brigitte Bardot's on French cinema or Marilyn Monroe's on Hollywood." That being said, in my case at least there is no question that Tsai Ming-liang is responsible for introducing me to and awakening an appreciation for the vibrant talents of Grace Chang through his incorporation of her vocals into his movies, particularly The Hole. And it's perhaps a bit more clear now why he chose to do so. Brian Hu's Senses of Cinema analysis of Tsai Ming-liang's The Skywalk is Gone (2002) notes that the film is "nostalgic for three kinds of film: the popular Mandarin Chinese films of the '60s, the films of the Taiwan New Cinema of the '80s and '90s, and the films of Tsai Ming-liang himself. By longing for three major waves of Taiwanese film history, the film demonstrates the interminability of nostalgia for the cinema. 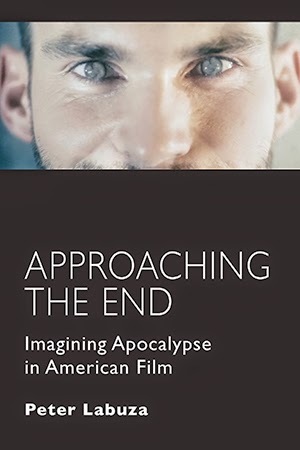 From each passing epoch develops a new cinematic tradition to miss." "As in The Hole," Hu continues, "The Skywalk is Gone communicates with 1960s Chinese cinema through popular song. Famous outside of Asia for its martial arts films, 1960s Hong Kong cinema also saw a flourishing musical genre. Among its most popular stars were Lin Dai and Grace Chang, the latter's songs appearing prominently in The Hole. 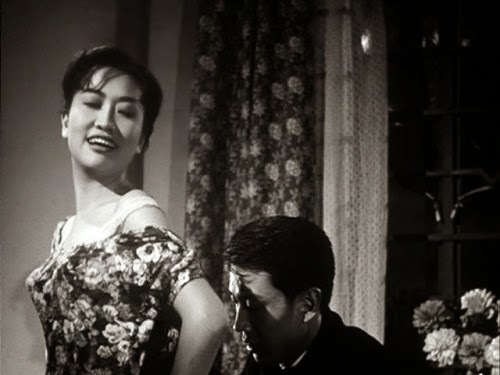 Tsai has cited these early musical films as direct influences on his own filmmaking . . . ." The musical numbers from The Hole come "from an earlier era of Mandarin music extremely popular in Taiwan in the 1960s" and perhaps signify "an escape from the dull urban sounds of the city." Fran Martin writes in her Senses of Cinema essay ("The European Undead: Tsai Ming-liang's Temporal Dysphoria") that Tsai Ming-liang's films "perform parallel citations of Chinese cinemas." She notes how The Hole, in particular, is punctuated by song-and-dance numbers featuring the songs of Grace Chang, the star of many 1950s Hong Kong musicals (including The Wild, Wild Rose). Comparably, in What Time Is It There? (2001), he includes a sequence at the video stall where Hsiao Kang buys a copy of Truffaut's The 400 Blows, and we overhear another customer asking for films starring Grace Chang, Yu Ming, or Lin Dai. "This double citation of European art film, on the one hand," Martin writes, "and popular Taiwan and Hong Kong cinema, on the other, demonstrates that cinematic citation in Tsai's films is in itself a complex, hybrid practice, rather than any simple emulation of European film modernism." In her interview with Tsai Ming-liang, Nanouk Leopold asked directly about that scene: "In the beginning of the film there is a scene where someone in a video-store asks for a Yu Ming, Lin Dai or a Grace Chang movie. What kind of films are these?" Perhaps the reason Grace Chang became a diva for Asian queers is the same reason that several Hollywood actresses became icons for American queers. Nostalgia for golden eras past lend a religiosity to memory. Perhaps the nostalgia felt when seeing these old films, whether from the Cathay/MP&GI or the Hollywood studios is not so dissimilar, and not so much about a time gone by as it is about feeling displaced from the time one lives in and the current cultural attitudes one endures. Tsai Ming-liang seems to admit so himself. A certain surrogacy is sought in cinematic representations of yesteryear. Entrusted to the larger-than-life women of the silver screen are experiences—perhaps imagined experiences, perhaps desires—of who they might have been in another less realistic time? Or more cogently, contemporary disenchantment—as articulated by Patricia Arquette at the Academy Awards®—with how societal change remains as elusive as the stuff of dreams. As an appropriate segué from last November's wildly successful French noir series "The French Had A Name For It", the opening night double-bill for "A Rare Noir Is Good to Find" (running Thursday-Monday, March 19-23, 2015, at the Roxie Theater) is encaptioned "Vive La France!" 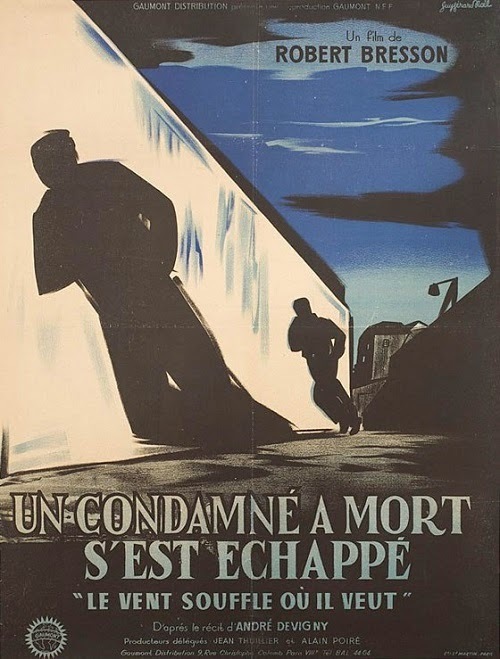 and pairs Robert Bresson's Un Condamné À Mort S'est Échappé (A Man Escaped, 1956) with Denys de La Patellière's Retour De Manivelle (There's Always A Price Tag, 1957). One celebrates escape while the other denies the possibility. As Donald Malcolm lays out in his program notes: "A Man Escaped is singularly revered French director Robert Bresson's first overt acknowledgment of film noir as a narrative / stylistic force. (He would follow up on this in 1959's Pickpocket.) 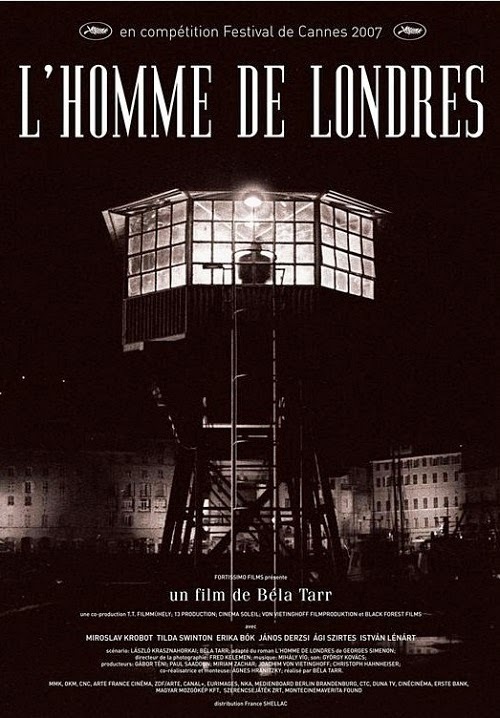 This tense tale of a French political prisoner methodically planning his escape from a Nazi prison is justifiably considered a world classic, though its self-contained perfection seems to prevent it from being screened as regularly as it should be. Bresson's masterful use of non-actors reminds us of the intersection between noir and neo-realism; however, Bresson was using such techniques even before neo-realism first flourished in Italy immediately after WWII." Included in the Criterion Collection, A Man Escaped has been given Criterion's full treatment, including Tony Pipolo's valuable essay "A Man Escaped: Quintessential Bresson", Kate Elmore's list of 10 things she learned from watching A Man Escaped, David Bordwell and Kristin Thompson's visual essay (which details how a variety of sound techniques can function throughout an entire film), and a visual essay that poses three reasons for watching the film. 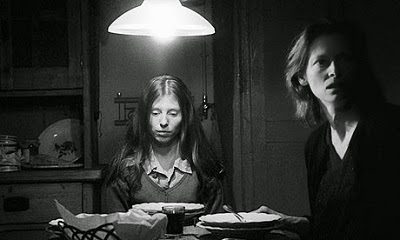 Reams have been written regarding Bresson's body of work and A Man Escaped in particular so I'll simply aggregate some recommendations and move on. Though it hasn't been updated in a few years, robert-bresson.com remains essential and Doug Cummings reviews A Man Escaped with customary depth and insight. Likewise relevant and requisite would be Alan Pavelin's contribution to the Great Directors database at Senses of Cinema; the Offscreen tribute to Bresson with Pierre Pageau's focus on A Man Escaped; Gary Morris's write-ups for Bright Lights Film Journal and Images; Acquarello's reviews at Strictly Film School; Kent Jones's Film Comment introduction; Sarah Jane Gorlitz's Kinema essay "Robert Bresson: Depth Behind Simplicity"; Colin Burnett's Academia.edu essay "Bresson in the 1930s: Photography, Cinema, Milieu"; filmmaker kogonada's visual essay on Bresson's use of hands in his films, and the film's trailer. 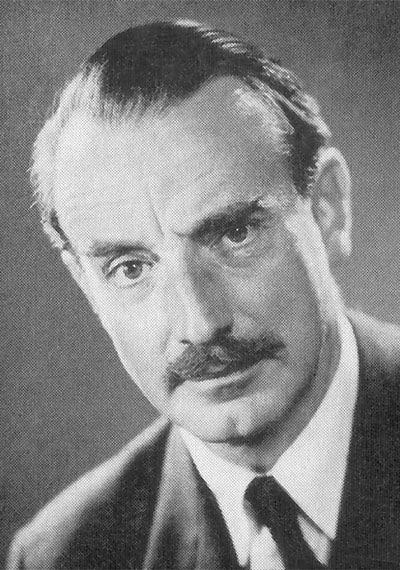 Considerably less has been written in English about Denys de La Patellière's Retour De Manivelle (There's Always A Price Tag) so let's start first with Donald Malcolm's synopsis: "A more conventional noir situation is found in Retour De Manivelle, which features an icy twist on the 'collect off the corpse' sub-genre. There's something quintessentially French about a cold-hearted wife attempting to make suicide look like murder—the exact opposite of so many of these schemes! 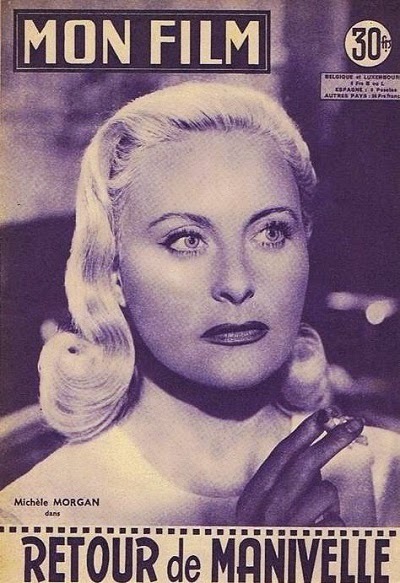 "The luminous, almond-eyed Michèle Morgan, remembered most by American noir aficionados for her selfless portrayal of the long-suffering wife of a semi-unhinged mob boss in Arthur Ripley's The Chase (1946), takes the temperature reading of frigidity down to absolute zero—despite her suggestive boudoir poses that capture the lower half of men's imaginations. In this case, that man is Daniel Gélin, France's composite 'answer' to Marlon Brando, John Garfield and Dustin Hoffman, a down-on-his-luck artist who walks into a viper's nest when he rescues Morgan's suicidal lout of a husband (Peter Van Eyck) and lands a job as the doomed man's chauffeur. "Needless to say, Gélin (a man whose off-screen life was, if anything, messier than what his character endures here) is taken for a ride that he (and the audience) could never have anticipated. The alternate title for Retour De Manivelle is There's Always A Price Tag (taken from the source novel by James Hadley Chase, England's answer to James M. Cain)—and truer words have never been spoken." 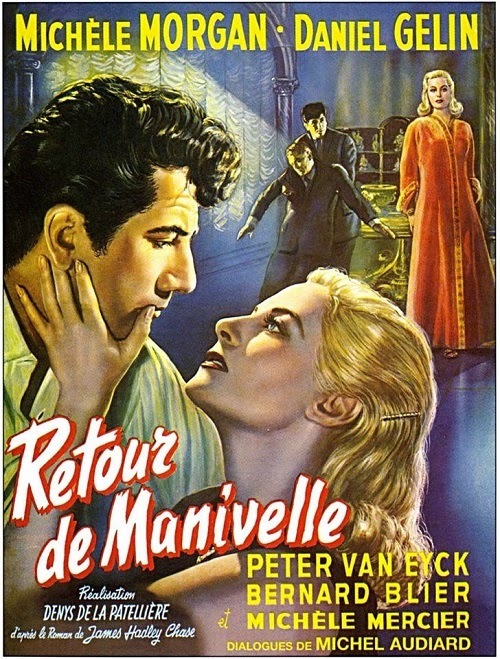 Inspired by reading James M. Cain's The Postman Always Rings Twice, James Hadley Chase became a prolific writer, penning 90 novels, 50 of which have been adapted to film, including two of my favorites from the Roxie's French noir series—Une manche et la belle (Kiss For A Killer, 1957) and Chair de Poule (Highway Pickup, 1963). 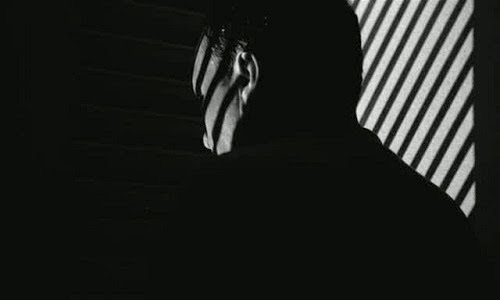 It's then, perhaps, no wonder that I found Retour De Manivelle such a satisfying noir with all the characteristics I appreciate in noirs: a femme fatale, a chump manipulated into an inescapable cul-de-sac, and a bleak misogynistic attitude that capsizes love into ruthless passion. Chase's pulp thriller There's Always A Price Tag was published in 1956. Some speculate it took its lead from Cornell Woolrich's The Black Path Of Fear (1944), whose filmic adaptation The Chase (1946)—coincidentally enough—starred Michèle Morgan during her brief stint in Hollywood. Denys de La Patellière pounced on There's Always A Price Tag to deliver Retour De Manivelle a short year later, converting its original setting from a Hollywood mansion to a luxurious villa in Saint-Jean-Cap on the French Riviera. 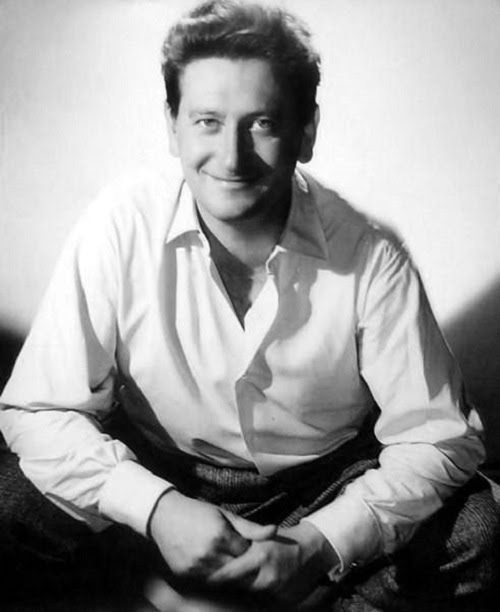 Known for his escapist entertainments (often starring Jean Gabin), de La Patellière was one of those French directors—as Donald Malcolm detailed in our conversation for "The French Had A Name For It"—whose emulation of Hollywood noirs rendered him unfashionable with the advent of the Nouvelle Vague, which purposely sought to break allegiances with American filmmaking. As Malcolm further suggested in our conversation, despite that petulant rupture in French filmmaking, "We're now in a position to rediscover who was working at the same level as the Hollywood actors we are accustomed to and have internalized in America. These actors and actresses are cooking with the same gas—maybe better gas in some ways than what we have here." Such would be the case with Daniel Gélin whose "uncouthness" had him expelled from college, but which benefited his filmic persona. As the rough-thumbed roustabout Robert Mabillon, Gélin learns—as Oscar Wilde forewarned—no good deed goes unpunished. He rescues well-to-do Eric Fréminger (Van Eyck) from a drunken suicide attempt, drives Fréminger home, is rewarded with employment as Fréminger's private chauffeur, and swiftly begins to think of how this unexpected windfall might benefit him. As the saying goes, that's what he gets for thinking for himself. Once he meets Fréminger's quarrelsome wife Hélène (Michèle Morgan, as an emasculating blonde), fate kicks into second gear. Hélène doesn't like him much and wants him gone, but Mabillon doesn't take to being told what to do, especially by an attractive woman, and he ignores Wilde as much as he ignores Walter Scott who cautioned: "Oh, what a tangled web we weave ... when first we practice to deceive." 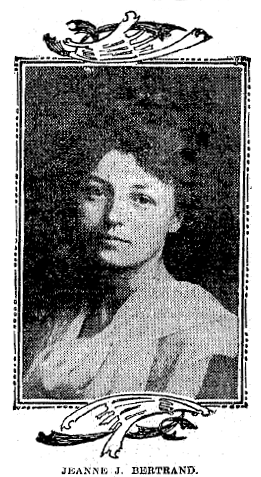 Deception becomes the downhill gradient on which this narrative flows, sourcing from the embittered fount of Hélène Fréminger, a woman who has wearied of marketing her wiles in a patriarchal world. "All my life I've been a thing," she tells Mabillon, "that people can buy, that they use. I've had enough. I've always had enough." True to Anastasia Lin's "bend or break" thesis (in her program essay "Feminism Without Feminists" for the Roxie's French noir series), Hélène Fréminger is a woman who "understands power, class, and gender in ways that a political science professor can only hope to do. 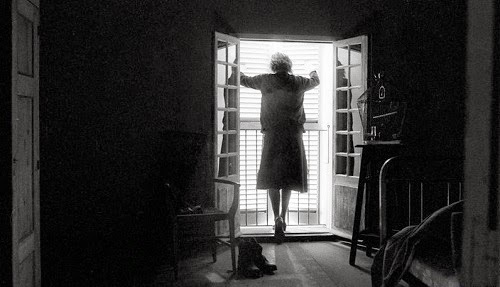 What makes it noir, of course—and 'French' noir to boot—is that none of that truly impressive knowledge and understanding winds up doing her any good." Hélène Fréminger: Is it an insult? Hélène Fréminger: Don't use up the word. You might want it later. It was always said to me as a word of love. She hates men, he distrusts women, and therein lies their complicit, if antagonistic, desire. A young maid Jeanne (Michèle Mercier, in an innocent pre-Angélique debut) is unwittingly brought in to further the duo's scheme but serves to remind Mabillon of everything he hates about Hélène, which is in essence everything he loves. Trapped in a corner, Mabillon's misogyny seeps to the surface as he sets out to destroy both women, albeit unconsciously. Jeanne's victimization in this film ironically predicted Mercier's own fate with men during the course of a career blemished by the success of Angélique, marquise des anges (1964). Add a deliciously droll performance by character actor Bernard Blier as a police inspector who's smarter than he lets on and a comic touch is added to the suspense building to its inevitable "icy" twist. This double-bill is, at once, a primer on the forces during WWII that affected cultural attitudes throughout Europe and specifically France after the war—attitudes that don't escape as successfully as the prisoner Fontaine in Bresson's classic. That film's triumphant ending segués into the unflinching fatalism of Retour De Manivelle, and many other disillusioned films throughout the world represented in this series. Highly recommended, but not for the faint of heart. Then again, noir never is. 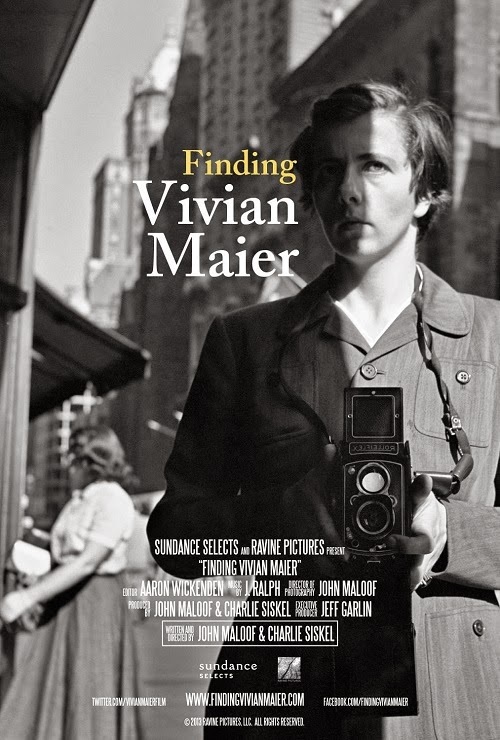 The story told by John Maloof and Charlie Siskel's documentary Finding Vivian Maier (2013) is intriguingly open-ended, provoking questions not only about the biographical details of a charismatic yet mysterious artist, but also about the nature of art itself. Is art a fundamentally private enterprise that achieves a public only by chance and good fortune? Is it first a communication with oneself that then hazards expression with community? Where does self-preservation and ambition fold into the mix? Does great art supercede the artist who creates it? 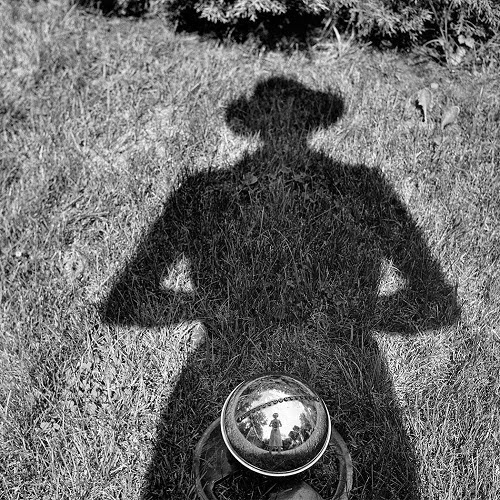 Finding Vivian Maier is as much a philosophical inquiry into the meaning of art as it is a biographical portrait excavated from the chance purchase by John Maloof of numbered lots at an auction, whose trunks—once opened—revealed the work of a woman speaking to a world not yet poised to listen. The documentary first came to my attention when it won the John Schlesinger Award at the 2014 edition of the Palm Springs International Film Festival. 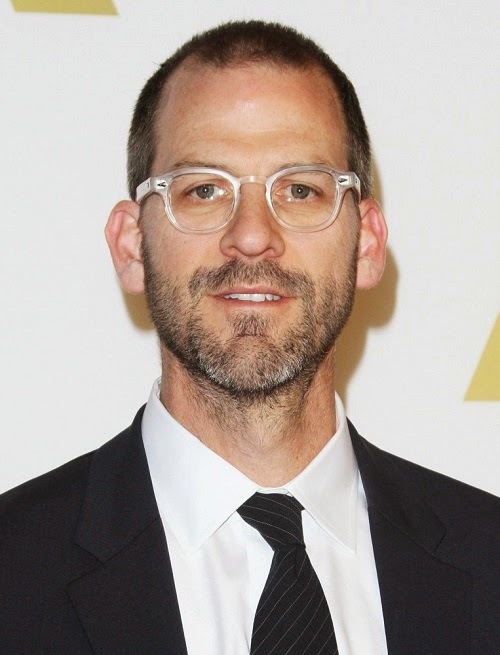 Alongside numerous nominations, the film likewise won the Grand Jury Prize at the 2014 Miami Film Festival, received Creative Recognition for Best Writing from the International Documentary Association and the 2015 Cinema Eye Honors Award for Outstanding Achievement in a Debut Feature Film, and Sunday will reveal whether it takes home the Academy Award® for Best Documentary Feature. As part of its ramp-up to Sunday's Academy Awards®, a special screening was given in San Francisco on Thursday, December 18 to an invitation-only audience, and I was honored to introduce the film and engage director Charlie Siskel in conversation afterwards. As Gene Siskel's nephew, Charlie's nomination for an Oscar® bears a measured irony for beating out the popular Roger Ebert tribute Life Itself (2014). After watching the film, I invited each member of the audience to turn to their neighbor and imagine what kind of hidden artistry they had within them, and then invited Charlie Siskel to the stage. Michael Guillén: First, let's set up some back story. 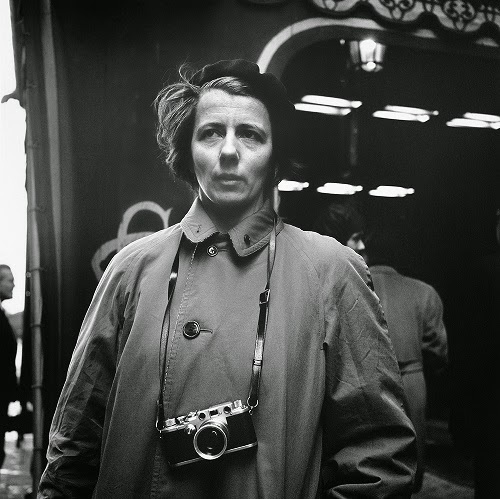 My understanding is that your co-director John Maloof had discovered Vivian Maier's work in an auction lot, had been working with it, and then decided that a documentary was in order. Through Michael Moore, you were recommended as the person to come in to help with the filmic element of this project. I'm interested in co-directorships and what goes into two people making a film, so can you talk a little bit about what your strategy was with each other to develop this project? Charlie Siskel: Certainly. So, I got involved as you mentioned when I got a call from Jeff Garlin, who is best known for his work on Curb Your Enthusiasm. He's a Chicagoan and I grew up in Chicago. I actually grew up in the '70s and the '80s in the town, Highland Park, where Vivian was a nanny, purely a coincidence. No doubt, Vivian was probably in the neighborhood. Looking at hundreds of hours of Super 8 footage, I saw my elementary school, and some of the elementary school teachers who I had not so great memories about. It was an uncanny experience to see the ravines where I grew up. Those ravines were literally in my back yard. So that was all very strange. I got on the phone with John—this was 3½-4 years ago—and we just started to talk about what he had. Not only did he have over 100,000 photographs, he had hours and hours of Super 8 footage, hours of audio recordings, and he had just started to contact some of the families to shoot some interviews with them. John was not particularly familiar with documentaries and he didn't have a whole lot of references for what kind of film he wanted to make; but, we started to talk about the story. I started to recommend certain films that he should watch and that was sort of the beginning of what turned into a four-year collaboration where we would bounce ideas back and forth about what kind of film we should be making. You mentioned excavation in your introduction and the visual overhead shot of John sifting through all of the material and laying it out in a grid-like pattern is very much what archaeologists do at a dig site. They create order out of chaos. They take a ruin and impose a certain scientific logic to it. They cordon off areas, create sectors and label things and that seemed like an apt metaphor for what we were trying to do. It's also a terrible metaphor because the process of understanding another human being is not scientific. We made a conscious choice not to include psychiatrists, psychologists, in the film—my apologies if there are any in the room—but it's just that I think something is lost when you try to reduce a person's life or their story, which is what I'm interested in, to a diagnosis. It seems like a way to end the conversation. In particular, there's a lot we have to learn about approaching one another artfully and thinking of one another's lives the way a novelist approaches a subject. But to get back to your question, the way that John and I worked was to have these larger philosophical discussions and then there were very practical issues about who would shoot what interviews and how we would frame things. John shot the film. He has a terrific eye. He is self-taught. You get a sense of the kind of person he is. He's a singular individual and, in some ways, the perfect person to have discovered Vivian's work. He has an obsessive attention to detail that this enterprise required. Also, he was young and a little bit foolish. People thought he was crazy at the time. Now, of course, it seems like a no-brainer; but, at the time, you have to remember these were undeveloped negatives for the most part and required a huge outlay of money that he didn't particularly have. He had saved up some money from working as a real estate agent and doing flea market sales, that sort of thing; but, he was dogged in his pursuit of this goal. The more he dug into it, the more obsessed he became with it. In terms of sharing the work, we fell into a natural working relationship where we would look at cuts together. I would say John had more of a hand and a focus on shooting interviews and I had more of a focus on telling the story, if I had to break it down simply. Guillén: With full respect towards your not wanting to psychoanalyze Vivian Maeir, you did however quite expertly present her psychological complication. One of the ways in which you did that was in your usage of the original material. When you were presenting her persona as an artist, you were showing us these tremendous photographs that were works of art, and yet when you were trying to talk about her as a person with some of these complicated issues that were being revealed in the on-screen testimonials, you stuck to snapshots and home movie footage, almost like they were B-reels. Can you speak to that strategy and that creative decision? Siskel: Yes, we did have these two types of materials to work with. Specifically, there were photographs that were clearly Vivian's art, and then there were photographs and Super 8 films that were essentially B-roll or snapshots of family, documentary material in that way. Vivian was a brilliant artist who experimented in a range of different styles. She was interested in abstract work in her photography, experimenting with light and composition, but she was also interested in real documentary subjects, social justice, and documenting people on the fringes of society, street life and classic street photography. But she was also a woman living in the sleepy suburbs of Chicago where not much was happening so she would go to the inner city, to the stockyards, to skid row in Chicago, to get in touch with real life. When something finally happens--a kid gets hit by a car on a bicycle--there was Vivian with her camera because finally there's a story. Vivian is a natural story teller. She was interested in documenting such events with her camera. These are photographs that clearly aren't Vivian's art, but are more documentary material. That was how we used both. Initially, we thought of Vivian as a nanny who somehow lucked into becoming a photographer and managed to take these 150,000 photographs; but, by the time we finished and as we spent more and more time looking at the material and thinking about Vivian, her character, we realized we had it 180º wrong. Vivian was truly an artist—that's who she truly was—and she was masquerading as a nanny. Being a nanny was a means to an end. It was what allowed her to take her pictures. Once you recognize that the answer to the riddle is that Vivian was really an artist, that's who she was, trapped in limiting circumstances as a woman in the 1950s-1960s with the barriers that represented in the art world, but also as a member of the working class—she's working as a nanny and a maid and a domestic worker—and then there were other barriers as well. It was intimidating to share her work as an artist. But once you recognize that that's who Vivian really was, the rest of her story starts to make a lot more sense. 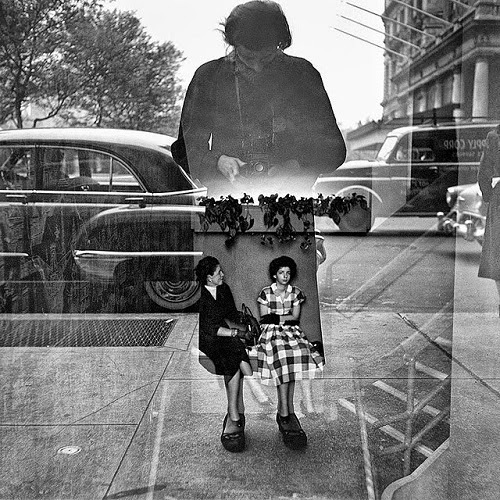 Guillén: It strikes me that Vivian Maier had a self-defined persona. I get the sense she knew she was an artist and yet she was somehow unmoored in the flow of time. As a street photographer myself, she was using aesthetics of ephemerality and the passing of moments to try to situate herself and, in that process, chronicled and observed history. I used the archaeological reference because my university training was in archaeology. I was a Central American archaeologist focusing on the Maya. What I walked away with from those studies was that the Maya—who are famous for their beautifully sculpted lapidary works—never meant for much of that art to be seen. Much of that art, the minute it was made, was thrown into a cenote or buried deep in a cave or incorporated into the initial structures of architecture as propitiatory offerings. Learning this about the Maya made me question: what is the real purpose of art? How does art energize the world? Does it energize it as artifact—a painting on a wall or a sculpture in a garden—what we would now narrow down to privatized ownership, or does it energize the world by mere presence? In the case of the Maya, an invisible presence? A hidden presence? 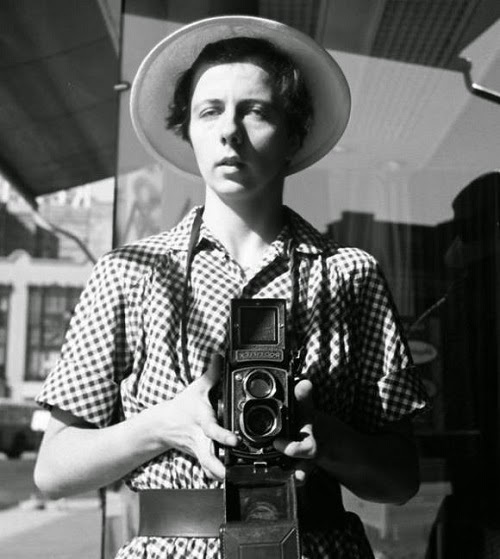 I know you've touched upon this in the film, but have you reached any answer or come to a comfortable position to understand why Vivian Maier didn't take the necessary step to bring her art out into the world? Siskel: Thank you. That's a wonderful way to pose that question. That is the central question of the film. It's what creates tension in the film and, therefore, a story. We obviously play with that in the film. We have someone who says flat out, "Vivian would have hated this. Those were her babies and she would not have wanted them on display." I firmly disagree with that and yet I included that interview in the film. It's there because that's the conversation we want people to be having; but, I think the woman who said that is wrong. I don't think she understands Vivian at all. Obviously we have people contradicting each other in the film at many places. Someone says her accent was real and another person says her accent was fake. You get to decide. Maybe it's a little of both? My feeling is that Vivian didn't show her work during her lifetime in fact, but that isn't evidence of her intention. Just as the facts of many of our lives, most I would say, aren't always evidence of our intention. The fact that maybe none of us in this room are millionaires doesn't mean that none of us want to be millionaires. Guillén: I can vouch for that. Siskel: Vivian, I believe, wanted to show her work. She made attempts to show her work. She didn't, in fact, show her work other than the few examples we show in the film. She did print these postcards and tried to make a business out of selling these postcards in France. She sent these landscape images to the printer in France, he printed them, and she wanted to print other images in the same way. She talked about night photographs, street scenes, and this was clearly her documentary material and art. I think there were many reasons why Vivian didn't show her work. I mentioned earlier there were barriers posed as a woman, as someone working in people's homes. She's living an itinerant life, moving from house to house, carrying boxes with her wherever she goes. She doesn't have a lab. She's not set up to print her own work. It would have also been incredibly expensive to do. It's time-consuming. She did do some printing, as we mentioned, but she was not very good at it. It's difficult. That's why some photographers work with printers. Then there's also the fact that it's intimidating to show your work as an artist. You risk rejection. You risk being told that your work isn't good. Finally, I would say, that habits set in. This is certainly true for me and, I imagine, it's true for other people. It's true for Vivian. She got into a pattern. She got used to the idea that someday the photographs would be printed. What's incredible, and what's marvelous and ultimately heroic is that Vivian continued to do the work. She was never deterred for decade upon decade for over 50 years without the validation of the public, without other artists seeing her work, without collaborators, without printers or galleries supporting her. She continued to do the work of an artist. That's what artists do. I understand why some people are drawn to keep their art private—and your Mayan example is a good one; Emily Dickinson is another who famously wanted her work destroyed but her work wasn't destroyed. Kafka was another one who wanted some of his writings to be destroyed. Thankfully, they were not. In Vivian's case, she didn't destroy her work. She didn't tell anyone she wanted her work to be destroyed. She did the opposite. She preserved it, meticulously and at great expense. She spent tens of thousands of dollars over time keeping up storage lockers. This notion of the artist who is creating art for art's sake or who is creating a private art that is too pure to share with the public is a bit overstated. For me, I find it a little pat. There may be people who disagree and I welcome that and, obviously, the film invites that conversation. Ultimately, as Degas said, art is not what you see; it's what you make others see. I believe that's true in Vivian's case. Her art is not what she saw through the camera and then hid away in storage lockers, it's what we're seeing now. It's what you saw. It just didn't happen during her lifetime. She would have been better for that. It would have been interesting to see the direction that her life might have gone if her work had been discovered and appreciated. I do think she would have been gratified to know that her work is finally finding the audience that it was intended for. Guillén: Her brilliance is made more poignant to me by the fact that she was helpless in a way and dependent or hoping for chance to provide opportunity. Audience Member: I was intrigued by the sequence in the documentary where it was revealed that Vivian's mother was also a photographer. Is anything further known about her parents? Siskel: Yes, Vivian's mom did take pictures. That was her Brownie camera, which is a very simple camera and the kind of camera that Vivian started on. We don't know much more about Vivian's mother or her father. Her father Charles was Austrian and Vivian's mother was born in France. She worked in New York as a seamstress in, essentially, a sweat shop. They moved around. We didn't include this in the film, but at one point—after her father was out of the picture—Vivian and her mother lived with a woman photographer named Jeanne J. Bertrand who was a French portrait photographer. We were intrigued by that. Did Vivian come under Jeanne Bertrand's influence in some way? There are some people who have wondered and speculated about that influence, but we just don't know. We know that Vivian and her mother were living with Bertrand at age four and that by age twelve she is not. She may have been living under the same roof from four to eleven, but we would be speculating. Audience Member: Have the museums changed their attitude towards Maier's work? Siskel: Not really. There is some growing acceptance. The film is playing at MOMA, which is a nice little irony. There is interest but we are still at the stage where no one quite knows what to do. John reached out to these institutions because, specifically, he needed help financially, as well as their expertise. He ended up finding that expertise through others like Joel Meyerowitz, Mary Ellen Mark, and Howard Greenberg (who represents many great photographers) and through having to finance the work through sales of the prints. Those institutions are, obviously, slower to come around and adjust. They don't canonize an unheard-of brand-new photographer overnight; but, our hope is that will happen. We think it should. Audience Member: I'm intrigued by Maier's audiotapes and what you might have learned about her through them? Siskel: I'll tell you one funny story. We found a lot of audiotapes that were very muffled sound but sounded like singing. We also had a lot of Super 8 footage where Vivian was shooting plays, operas or musicals. We finally put the two together and realized that Vivian was basically bootlegging musicals in downtown Chicago at the Schubert Theater, hiding an audio recorder under her coat and shooting film from down low. To what end? We don't really know. She was just interested in culture and in what was happening in the world politically at rallies, that sort of thing. The material we used in the film where she was interviewing people about the impeachment reflected, again, that she was living in this little town outside of Chicago where nothing was really happening. We have one audio recording, which we didn't use in the film, where she shows up at someone's doorstep, knocks on the door and says, "I understand that you met Rudolph Valentino when he was in town? Is he as good-looking as he is in the movies? I hear he's not as good-looking. Is that true?" Vivian was looking for people who had real experiences that somehow stood apart from everyday life. I think she found suburban life a bit boring, tiresome and mundane. She was a real Socialist. As one of the more astute subjects in the film points out, Vivian might have looked down on some of the families she was with. She was self-taught, very well-read, and had obviously traveled and seen the world and was familiar with what was happening with other cultures. She was certainly reading the New York Times. I don't know if her employers were. There were many areas that interested her and I think she used the audiotape recording and the Super 8 footage to explore her interests. She was like a radio producer producing radio documentary pieces. The footage that we show of the babysitter who was slain, there Vivian is making a film in the camera, editing it within the camera, while walking in the footsteps of this babysitter who had been murdered. She was a natural storyteller and was interested in telling stories through still photographs, moving images and audio recordings. That being said, she was not making audio diaries. They were not confessional in nature. If they were, we would have included that. I don't think Vivian was interested in self-analysis in that way or in telling her own story. What's intriguing is the fact that she did take all these self-portraits. There are so many self-portraits. As someone who is described by some as reclusive and private, I don't think she was private at all actually. I think she was incredibly extroverted. She went out into the world. She was taking pictures. She's chatting up people at the antique store and the book store. Vivian was no wall flower. She was out in the world as a force of nature. Going back to the question of how Vivian would have felt about all of this, for me what is most telling is not what her employers thought of her. They were her employers, she was the help, and she was going to be dismissed at some point; that was the relationship there. She would either be dismissed because she had crossed some line or because the kids would get older. That relationship with her employers was fraught, because at the same time she was very intimate with them. She was living with them and taking care of their kids, she was supposed to love them as if they were her own children, and yet she could be dismissed, and was. 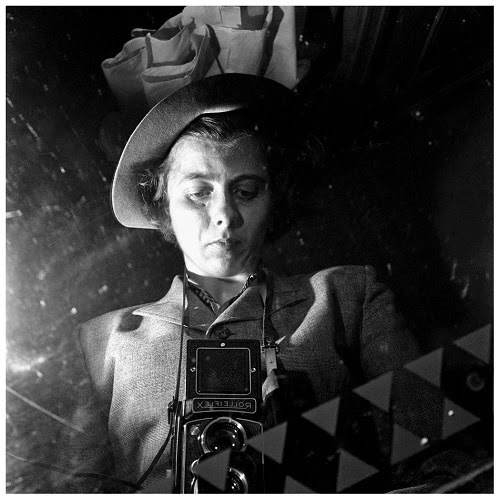 If you really want to know how Vivian saw herself, look at those self-portraits. Those are portraits of an artist. Vivian sees herself as an artist. They are like Rembrandt's self-portraits, or Van Gogh's self-portraits—not to compare her to those artists necessarily—but, only to say that they have all the hallmarks of self-portraiture. Audience Member: I'm fascinated in both her early childhood and her later life. What were her photos like in her later life? Has her work been placed in any kind of chronology? Siskel: Vivian had switched to largely color film in her later work, 35mm, and she continued to be interested in social issues, but not as much traditional street photography. She's not shooting people as much. She's looking at abstract themes: graffiti, political messages, newspaper headlines, that sort of thing, plus some abstract color work where she's shooting puddles, and light. There are about 700 rolls of color film that have not yet been developed. They are in cold storage because they're very fragile and susceptible to damage. We don't know what will be found, if and when those rolls are developed. Audience Member: Without the advantage of seeing what is on those rolls, do you fear your documentary portrait is incomplete? Siskel: I'm curious to know what's there. It will be a costly process to develop them carefully without damaging them. But your point is a good one. In telling the story through this metaphor of taking all of Vivian's personal effects and laying them out as if they're butterflies on display, as if we've scrutinized each and every business card, every receipt, every number scratched on a piece of paper, that was the task, right? We're sifting through to find and piece together this person's life and their story. Now imagine that we were to do that with your closet or your bureau, right? Half of that stuff will be evidence of nothing at all. It's just stuff that you forgot to throw away because you got lazy or because it was a business card on whose back you had written down the combination of a lock. It was a maddening process. We were on some level tormented with the thought that we might be missing something, that we might get something wrong, that we might omit something, that we might not have looked on the back of a business card to find what was really relevant. At a certain point we came to the liberating conclusion that wasn't really the job. Once you recognize that some of what you're finding is evidence and some of it is evidence of nothing at all—and that's the nature of this kind of documentary storytelling, let alone the nature of human life and our interactions with one another—then you free yourself of the idea that you won't be done until every last piece of evidence is scrutinized. Maybe something will come out? Maybe someone will come forward and it will turn out that Vivian had a third identity as a world-famous baton twirler. I doubt that, I don't think that's true; but, I suppose that's possible. At a certain point, you just have to free yourself of this burden that the work isn't done until every last stone is turned over. I'll go further and say there's a decent chance that there are boxes of Vivian's work that were lost and were never found. Audience Member: It strikes me that the meager salary she would have been making as a nanny would have prohibited her ability to develop and print all of her own work. Siskel: Absolutely. Look, if she had not only been developing negatives but trying to make prints from those negatives, the cost of housing all of this—and housing this safely—would have been astronomical and it would have required an incredible amount of time on her part; time that she didn't have. As it was, she's taking the kids on these wild adventures so that she can take her pictures. Maybe part of it was to broaden their horizons and show them a different side of life? While other kids are going to the zoo, she's taking her kids to the slaughter house. Personally, I think they were better off. Vivian is exceptional in two ways. She is an exceptional artist and she's exceptional in that her work was discovered. That is the exception to the rule. Many artists, maybe most artists, never have their work discovered and it makes you wonder how many—as Michael insinuated at the beginning—great artists and works of art are lost? How many artists are sitting right next to you on the train writing the great American novel that will never be read? There's a tragedy in that. The tragedy in Vivian's case was that she didn't get to experience the recognition during her lifetime. The fact that it's happening now and that audiences are embracing her work and her story makes her's a story full of redemption rather than tragedy. 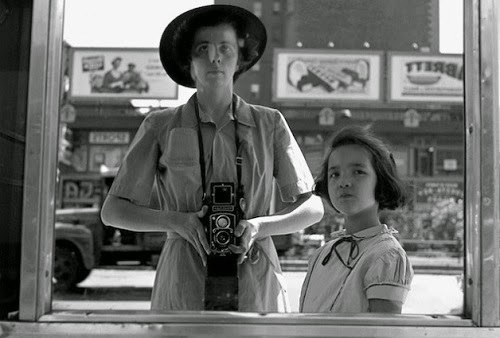 Audience Member: Finding Vivian Maier has some similarities to the documentary Searching For Sugarman, with regard to an unknown artist belatedly achieving visibility. Can you speak to that similarity? Siskel: I really enjoyed Searching For Sugarman. How would I compare the stories? I don't know exactly. As I said, I enjoyed Sugarman and I say that without necessarily being a fan of the music. I just thought the storytelling was very good. 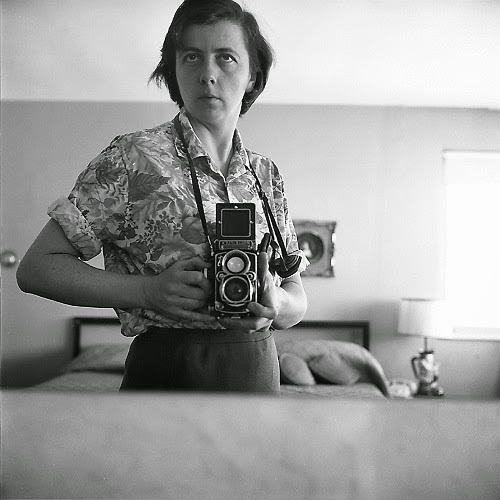 I guess one difference would be that I believe—and I'm not alone in this—that Vivian Maier will take her place in the canon of 20th Century photography. She will be compared to the great photographers of the mid-century and beyond. I don't know if that's true of Rodriguez. 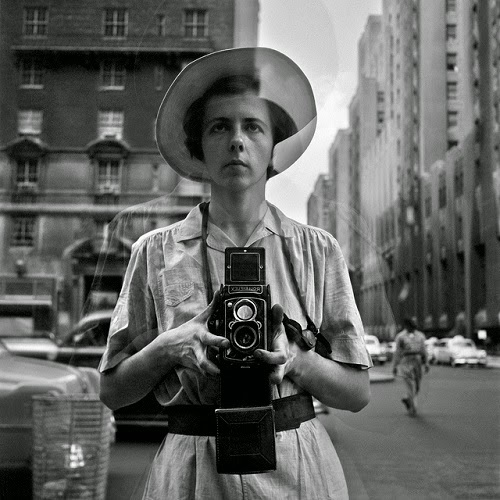 Fortunately, in the art world there are no rankings, there are no winners, and there are no "first place" titles, so we don't have to make those kinds of distinctions and it's probably just as well that we don't; but, history will ultimately look fondly on Vivian Maier.